Former Central Bank Governor Ajith Nivard Cabraal yesterday categorically denied any irregularities in bond sales during his term and said he was prepared to testify before any future commission but called for the Government to take action on the Presidential Commission’s report. Responding to the statement by Prime Minister Ranil Wickremesinghe on Sunday that the Government would have to pay a whopping Rs. 10 trillion over the next 25 years due to allegedly irregular bond sales of Rs. 4 trillion from 2008 to 2015 without the Central Bank’s Monetary Board approval, Cabraal flatly denied any wrongdoing. He also called on President Maithripala Sirisena to release the full report. “The main conclusion that can be drawn from the President’s statement is that the top leaders of the Government have worked out a compromise that causes the least damage to them. Even though someone may not commit the actual crime they can be guilty of aiding and abetting and in the run-up to the bond scam there were several actions by Prime Minister Ranil Wickremesinghe that could perhaps be construed in this light,” he said. 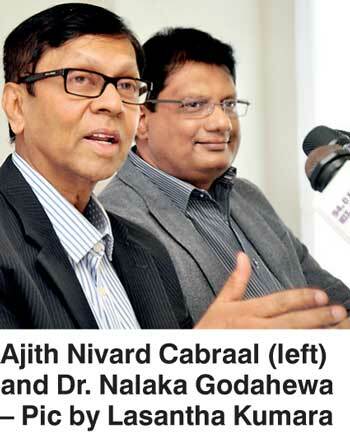 Cabraal outlined the removal of the Central Bank from under the Finance Ministry and allocating it under the Prime Minister’s ministry, the appointment of the Pitipana Commission, statements made to Parliament backing former Governor Arjuna Mahendran, the addition of footnotes to the second Committee on Public Enterprises (COPE) report and other developments since 2015 as efforts to cover up the fraudulent bond sales. The former Governor also denied any conflict of interest in his sister working for Perpetual Holdings, the parent company of Perpetual Treasuries, during his tenure as the head of the Central Bank. Cabraal, responding to questions, emphasised that he had repeatedly explained that his sister was employed only for one year and did not benefit from the bond transactions of Perpetual Treasuries. Cabraal also noted that several details, which emerged during the commission hearings, were not mentioned in President Sirisena’s statement. These included a witness saying State banks were requested to bid low by former Finance Minister Ravi Karunanayake and the role of Bank of Ceylon in releasing excess funds to Perpetual Treasuries for bond purchases. He also insisted losses incurred by the Employees Provident Fund (EPF) needed to be probed in detail to ascertain their extent. Cabraal also stressed that the Prime Minister’s allegations of Rs. 10 trillion in losses was made without any basis and said he was ready to go before any commission to prove this point, recalling that he had also volunteered to be present before several COPE committees during his term as Governor.